(3) Dept. Chem. & Biochem., University of Sciences in Philadelphia, USA. J. Mol. Model., 2001, 7, 422-432, [Abstract], [Local PDF file]. See the Ukrainian translation of the AmberFFC FAQ by M. Lisicca at www.designcontest.com. - In its original version, AmberFFC was designed to convert six AMBER force fields (FF) (Amber 91, Amber 91X, Amber 94, Amber 96, Amber 98 and Amber 99) freely available in the public domain, for use with commercial molecular modeling packages, using the Accelrys Inc. (formerly Molecular Simulation Inc. or Biosym Inc., San Diego) software package as a case model. With the version 1.2, AmberFFC converts three GLYCAM FF (GLYCAM_93 and two new GLYCAM versions) developed by Woods et al. for the Accelrys software. With the version 1.3, a modification of the Amber 99 version (Simmerling et al. 2002) and the GAFF force fields are also converted (Read the Frequently_Asked_Questions file, or "FAQ" file, for more information). 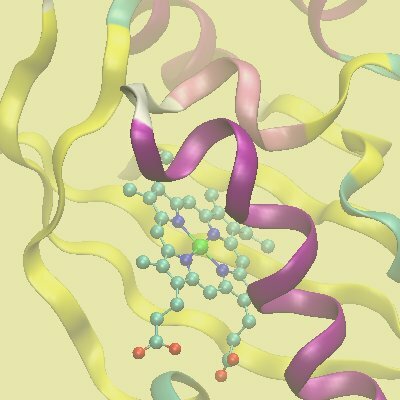 - AmberFFC creates the AMBER & GLYCAM FF for the Accelrys molecular mechanics modules, FDiscover and CDiscover by transforming the AMBER/GLYCAM topology database and FF parameter files to the Accelrys file format. Thus, the program is useful for any modeler who is interested in (i) using the AMBER & GLYCAM FF with the Accelrys software and (ii) comparing the results obtained with the AMBER and Accelrys modeling packages. - It has been written entirely with the Perl programming language (See also the CPAN web site), making it highly flexible and portable. Indeed, AmberFFC runs on different UNIX computers such as Hewlett-Packard, SGI, IBM, Linux-PC or SUN as well as on Win32 (Windows NT, 95, 98, 2K) workstations. We did not tested it on Macintosh platforms. - We plan to work on the expansion of the capabilities of AmberFFC. New versions of AmberFFC will be able to convert AMBER & GLYCAM FF for use with Sybyl, Spartan and Hyperchem software. These additional capabilities will make AmberFFC a "pseudo-BABEL" program for FF conversion. J. Mol. Model., 2003, 9, 271-272, [Abstract], [Local PDF file]. In September 2005, we received the following information from Accelrys Inc.
"I should update you on the status of those Discover_3 bugs you refer to on your page. The good news is that Torsion_4 energy bug has been fixed. We just released Insight II version 2005 and it contains version 2004.1 of Discover_3 (where your bug # 01051664401 - "Sometimes not all terms are used when 4 term torsion is used") is fixed. Unfortunately, the other bug regarding out-of-plane energies has not been fixed. But as you know, these energy differences are probably negligible so this really is a minor issue." After 4 years or so, this bug correction makes the use of AMBER force fields (converted by AmberFFC) in Discover fully effective. We are grateful to Accelrys to have corrected this dihedral bug; the out-of-plane bug being not that important as just reported. However, since we do not have this new Discover version, we do not have the possibility to check this. Finally, we do believe that the information provided in the reference above (F.-Y. Dupradeau & J. Rochette, J. Mol. Model., 2003, 9, 271-272) is still up to date. Indeed, in our opinion, opening the source code is the only way to allow quick and efficient bug corrections. - The list of programs from www.my-edu2.com. AmberFFC belongs to the q4md-forcefieldtools, and is distributed under the GNU General Public License. Please click, HERE, to access to the q4md-forcefieldtools registration page. Please click, HERE, to access to the q4md-forcefieldtools download page. Last update of the AmberFFC Home Page: January 6th, 2016. Université de Picardie - Jules Verne. © 2003-2016. All rights reserved.